Today saw the beginning of three official days of mourning in China, with 3-minutes silence at 14:28 exactly one week after the tragedy. When the soldiers almost gave up on one of the rubble sites due to aftershock, one of the soliders noticed that there was a dead woman positioned in a strange way amidst the rubble. She was kneeling down with her arms pushing against the ground in front. The soldier took a closer look, and found there was a 3-4 month old baby still alive under the mother's protecting arms. When the boy was taken to the hospital, the nurse found a mobile phone inside the baby's blanket, and on the screen there was an unsent text message that read - "My dear, if you can stay alive, you must remember that I love you." Sichuan is a province in western China, with its capital Chengdu. Sichuan has been historically known as the "Province of Abundance, " as it is one of the major agricultural production bases of China, providing the major production of grain, including rice and wheat, since 1999. Commercial crops include citrus fruits, sugar cane, sweet potatoes, peaches and grapeseed. Sichuan also had the largest output of pork and the second largest production of silkworm cocoons, of all the provinces. 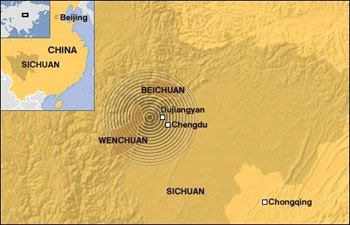 Sichuan is also one of the major industrial bases of China. In addition to heavy industries such as coal, energy, iron and steel industry, the province has established a light manufacturing sector comprising building materials, wood processing, food and silk processing. Chengdu, the provincial capital, is one of the most important economic centers and transportation and communication hubs in China, as well as one of the production bases for textiles and electronics products. Chengdu is not only the gateway of Western People's Republic of China for foreign financial institutions, but also a booming town for Chinese domestic financial firms. The Three Gorges Dam is being built on the Yangtze River in nearby Hubei province to control flooding in the Sichuan Basin.